I’m delighted to announce the launch of a new Podcast series based on my memoir, Mystery of Memory: Telling My Truth, Standing My Ground. As many of you know, I am an organizational consultant and certified coach who helps individuals, leaders and teams tap into their creativity and potential to bring about change and transformation in their lives. One of the biggest obstacles I run into with my clients is self-doubt. It’s something I’ve struggled with myself too. In my case, it’s the result of experiencing sexual abuse during my childhood. Through my work and self-development, I’ve come to understand that individuals suffer from doubt and lose their voices for many reasons, including lifelong societal messages that are demeaning, degrading and silencing. 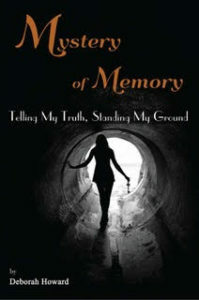 I wrote my memoir as a way to find my voice and overcome my own self-doubt. I hope insights from my story will help anyone who’s struggled with self-doubt move forward and find their voice too. Each week, in this podcast series, I’ll be reading a portion of my memoir. Please click here to listen to my podcast and join me in my journey. Also available on ITunes, Spotify and Google Play. Monty on Who Gets Believed?